Vladimir Stankovic is a talented graphic designer and illustrator from Serbia, currently based in Rovaniemi, Finland. He has created these amazing pieces of art titled, The Greys. I found them to be so amazing that I asked Vladimir if I could post a few of his pieces to Saucer Time! To which he kindly gave me permission. 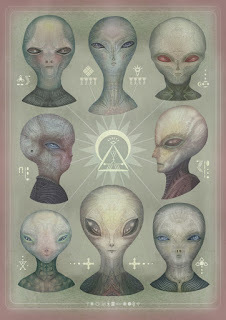 The UFO and extraterrestrial subject matter is one that has fascinated Vladimir since he was a kid. Visit his website here to learn more about the artist and his work. Enjoy!